The Basic PM Short Course is specifically designed for those who want to expand their knowledge of PM. 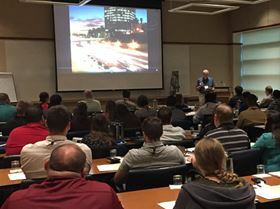 According to the MPIF, the organization’s annual Basic Powder Metallurgy (PM) Short Course, held in August, received excellent feedback from attendees, with over 93% stating that they would recommend the course to others. There was reportedly a broader range of attendees than in 2016. The largest represented industry segment was still engineering (33%), but quality control and testing and sales employees made up 19% and 20% of the audience, respectively. Production (12%), other (12% – mostly R&D), and management (5%) rounded out the short course attendees. The Basic PM Short Course is specifically designed for those who want to expand their knowledge of PM, improve their opportunities to advance and for those who are looking to deepen their understanding in the specialized area of PM, the MPIF says. The annual course is held every August.